In case you missed it (ICYMI) here is the September 1, 2016 edition of the newsletter we sent out to our Premium Members. 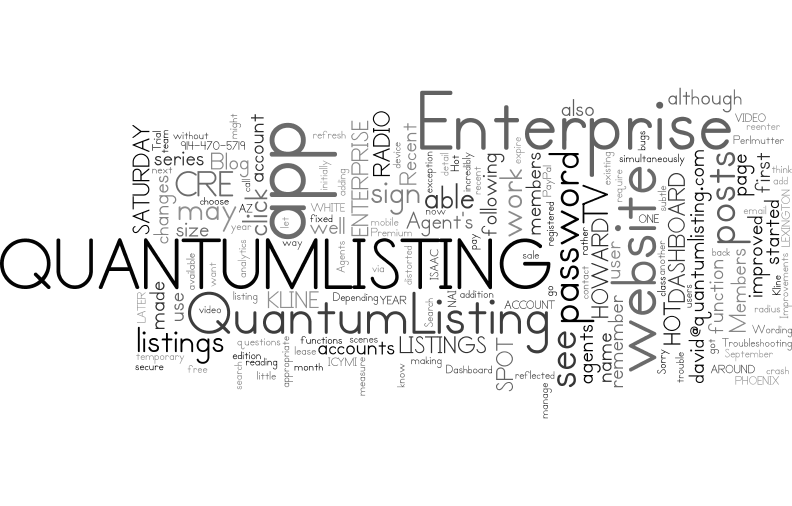 August was a busy month at QuantumListing! We made a few video demos on how to use QuantumListing, and a longer one exploring our Enterprise Dashboard. We started a series of posts with Howard Kline of CRE Radio & TV. We started another series of posts, QuantumListing Hot Spots, that highlights individual markets. And we reflected on our first year post-launch. We'll share the recent posts from the Blog first, then fill you in on the improvements to the website and what's next. A VIDEO OVERVIEW OF THE QUANTUMLISTING ENTERPRISE DASHBOARD - It's ten minutes long, but it's worth it. SATURDAY WITH HOWARD KLINE AND CRE RADIO AND TV - An interview with Laurie Baker, 2016 CREW Network president and SVP at Camden Property Trust. And an introduction to Howard Kline and our new series. THE VOYAGES OF THE QUANTUMLISTING ENTERPRISE DASHBOARD - With a name like Enterprise Dashboard, you knew there had to be a Star Trek reference sooner or later. QUANTUMLISTING: ONE YEAR LATER - Reflections on the first year. SATURDAY WITH HOWARD KLINE AND CRE RADIO & TV, EPISODE 2 - Just when you thought it couldn't get better, Hoard Kline interviews me at ICSC RECon 2016. RECENT LISTINGS FROM NAI ISAAC IN AND AROUND LEXINGTON, KENTUCKY - Really our first Hot Spot post, but we hadn't thought of the cool name yet. Love these folks at NAI Isaac. NEW WAYS TO SHARE LISTINGS - Aspirations, a rant, a plea - this one's got it all! WHAT DO YOU LIKE MOST ABOUT COMMERCIAL REAL ESTATE? - It's been a while since we ran a Twitter poll. QUANTUMLISTING HOT SPOT: WHITE PLAINS, NY - A shout out to my homies. QUANTUMLISTING HOT SPOT: PHOENIX AZ - As the late great Horace Greeley said, "Go west!" When you click on Enterprise or Agent's name, you'll go to their Profile page and see their listings. If it's an Enterprise, you'll also be able to click a tab to see all of their Agents, in addition to their listings. When you click through to a listing detail page, you'll be able to see the Agent's avatar and bio, too. We've put a PayPal payment system in place. As members Trial Memberships begin to expire, they'll have a convenient and secure way to renew. Members can also pay through the app as before, with the exception of Enterprise members. That will require an app refresh. We've improved the Search function. You can now choose the radius for your search as well as filter by asset class, whether it's for lease or sale, price, size, and date available. We've improved some of the social functions, making it easier to see who is following you, and who you are following. We've done some behind the scenes work so that where appropriate, we can convert existing users to Enterprise accounts and add their agents without having to reenter all of the agents and listings. If you think your account should be upgraded to an Enterprise account, let us know. There have been lots of subtle user experience changes, too. Wording on pop-ups has been clarified and, bugs have been fixed. If you initially registered via the QuantumListing app and have not been able to sign in on the website, try opening the app, sign out, then sign back in. This is the unintended consequence of having the app and website designed serially rather than simultaneously. If you can't remember your password, the recover password function on the app may not work, so send an email to me at [email protected] and we will help issue you a temporary password. You can then easily change the password on the website. The app is still very resilient, although some of the changes we've made to the website do cause it to crash, such as tapping on the user name. Sorry! If you are having trouble with the app, then you might want to use the website from your mobile device. Depending on your screen size and shape, some of the images may be a little distorted, but other than that, it works incredibly well (although links in blog posts may not work - got to remember to tell the team about that!). We're working on adding analytics to Enterprise accounts. If you can measure it, you can manage it. Thanks for reading. Feel free to contact David Perlmutter at [email protected] or call 914-470-5719 with any questions, comments or suggestions.